*This workshop is specifically for any one who identifies as female, trans, or gender non conforming. We’re excited to be hosting a Frailty Myths Woodworking Workshop in New York for the first time! This workshop will cover how to operate a number of basic power tools and apply those skills to a small carpentry project that you get to take home with you. The workshop includes discussions on the how patriarchy impacts us and societal myths that surround tools and building that often keep women from comfortably participating in these spaces. Tools and materials will be provided. The speed and direction of the workshop will be participant led. All of the facilitators identify as women and are volunteering their time. The objective of the workshop is to have an empowering afternoon learning new skills, confronting social myths, and gaining strength from each other. This workshop is offered for free in order to be accessible to low-income and marginalized communities. Please donate if you are able so we can continue offering empowerment workshops around the country. Suggested Donation is $100 but any amount is deeply appreciated. Any and all donations will first go to cover the cost of this workshop and any remaining donations will go toward future Frailty Myths events. 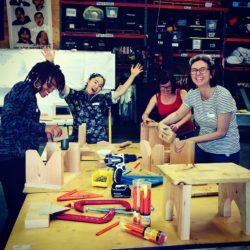 This entry was posted in Gender, Learning and tagged brooklyn, frailty myths, free workshop, gender equality, gender justice, new york, skills, smash patriarchy, tools, women carpenters, women empowerment, woodworking. Bookmark the permalink.